Donald I. Meyer, professor of physics, retired from active faculty status on December 31, 1996, following 40 years of service. Professor Meyer earned his B.S. degree in 1946 from the Missouri School of Mines and his Ph.D. degree in 1953 from the University of Washington. He taught at the University of Oklahoma from1952-55 and then joined the research staff at the Brookhaven National Laboratory. He joined the faculty at the University of Michigan in 1957 as assistant professor of physics. He was promoted to associate professor in 1961 and professor in 1966. Professor Meyer’s initial work at the University of Michigan involved bubble chamber experiments. Later, he collaborated in work on strong interactions and the associated production of strange particles. During this period, he worked on a technique for modulating the voltage on the cathode of a photomultiplier as a means of achieving very good time resolution. He also collaborated on the development of a spectrometer magnet and on optical spark chambers. Through the 1970s and early 1980s, Professor Meyer collaborated on hadronic physics experiments at Fermilab. Later, he and colleagues helped initiate the multi-university high-resolution spectrometer collaboration at the positron-electron collider storage ring at the Stanford Linear Accelerator Center. In the 1990s Professor Meyer collaborated in a gamma ray astronomy program at the Whipple Observatory in Arizona. Using Cerenkov radiation from gamma-ray air showers, the group employed a large mirror with a matrix of photomultipliers as its focus to observe photons with energies 10,000 times higher than could be studied by satellites. This resulted in detection of the first extra-galatic source seen at these energies, Markarian-421. Professor Meyer initiated a joint program between the Department of Physics and the College of Engineering to train Ph.D. students in practical applications of modern physics technologies, which led to the highly successful Program in Applied Physics. He also took leadership roles in the recently completed renovation of the Randall Laboratory and West Engineering buildings and helped design the new Physics Research Laboratory. In recognition of his role in helping to create the physics department’s outstanding physical facilities, the physics meeting room in 335 West Hall has been named the Donald I. Meyer Commons. The Regents now salute this faculty member by naming Donald I. Meyer professor emeritus of physics. Donald Irwin Meyer, 86, died peacefully on April 13, 2012 in hospice at Saint Joseph Mercy Hospital following a stroke. A private family service was held on April 15th. Donald had been a resident of Ann Arbor since 1956. He was born in St. Louis, Missouri on February 13, 1926, son of Irwin Julius Meyer and Louise (Ruga) Meyer. While working on his BS degree in Physics and Electrical Engineering at Missouri School of Mines at Rolla, he was drafted into the Army in 1945. He served during World War II at Los Alamos National Laboratory, and received his BS degree in 1946. He then completed a PhD in Nuclear Physics at the University of Washington in 1953. In 1957, after briefly working at the University of Oklahoma and Brookhaven National Laboratory, he joined the Physics Department at the University of Michigan where he was on the faculty until he retired as a full Professor in 1997. During his tenure at the University of Michigan, he worked on experiments at CERN (Geneva, Switzerland), Argonne National Laboratories (Argonne, Illinois), Fermilab (Batavia, Illinois), and the Stanford Linear Accelerator Center (Stanford, California), in addition to publishing over 100 papers. He oversaw a $60 Million project to renovate and construct new facilities for the Physics Department in Randall Laboratory and West Hall. He also conceived and worked to establish the very successful Applied Physics PhD program. Donald is survived by his wife of 61 years, Lee Meyer (formerly Mary Lee Rogers), whom he married on September 8, 1950 in Cheyenne, Wyoming. He is also survived by his children Kurt Meyer, a resident of Ann Arbor; Karla (Meyer) Oshanski, a resident of Northville, Michigan; Kraig Meyer, a resident of San Francisco, California; grandchildren Nicole (Oshanski) Massey, a resident of Allen Park, Michigan; Ashley Meyer, a resident of Boston, Massachusetts; Kari Oshanski, a resident of Columbus, Ohio. He is predeceased by several years by his sister, Virginia Henderson, who was a resident of Fairfax Station, Virginia. His passions included skiing, gardening, woodworking and his grandchildren. He served as an officer in the Ann Arbor chapter of the American Rhododendron Society, and on the board of the Ann Arbor Orchid society. 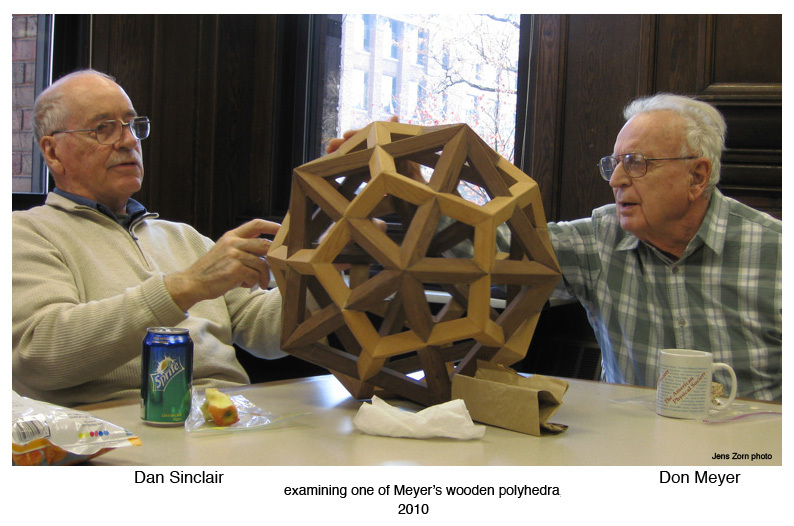 Donations may be sent in memory of Donald Meyer to either the First Congregational Church of Ann Arbor, 608 E. William St., Ann Arbor, MI 48104 or to the University of Michigan Physics Department Strategic Fund, 3003 S. State St, Suite 8000, Ann Arbor, MI 48109.